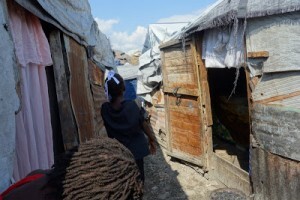 How long should we let hundreds of thousands of Haitians live in horrid tents and shacks after the earthquake of 2010? 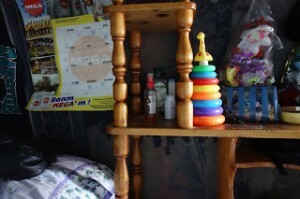 They have been living in squalid conditions for three years now. And how long should we let a two year old little boy named Elie live with a hole in his heart in one of these tents in Port-au-Prince? Until he dies? Yes, until he dies. When I first examined Elie in February of 2012 he was a tiny irritable toddler who clung to his mother more fiercely than any baby I had ever checked. He refused my exam as much as he could. He did not want to be separated from his mom even by the diameter of my stethoscope head. I feared for Elie from the start with the loud murmur in his chest and his “don’t touch me” demeanor. He seemed so fragile and knowing, which seemed like red flags for trouble. The swishing noisy heart murmur I heard with my stethoscope was turbulence of blood flowing through a tiny hole between the lower chambers of his heart. It is the most common congenital heart defect and is called ventricular septal defect. This defect made his heart and lungs do extra work with each heart beat. Over time it had thrown Elie into congestive heart failure and predisposed him to multiple bouts of pneumonia. So I treated Elie with medication for the extra fluid in his lungs and with antibiotics for his pneumonia. I put him on vitamins and medication for the worms that lived in his gut. I got his mother’s phone number and gave her money so he could get a chest x ray and an echocardiogram. She did everything I asked of her. Elie definitely needed heart surgery. Even though this is routine heart surgery in the States, it takes a skilled surgeon and cardiovascular team to repair the hole in a heart like Elie’s once he is on the bypass machine. Once the hole in the septum is exposed by the surgeon, the actual repair of the hole takes about 15 minutes using a small piece of the heart sack as the patch. Pediatric heart surgery is done in Haiti by random surgical groups that occasionally come to Haiti, but is not available most of the time for the majority of Haiti’s children–especially ones like Elie who live under tents. I notified an American organization that takes Haitian kids to the Dominican Republic for heart surgery. Elie was put in their data base. I wanted to be optimistic that Elie would be operated. Elie lived with his parents Elifete and Claudette and his four year old sister Karen in a tent in Cite Aviation. Aviation is densely populated tent city in Port-au-Prince where the Haitian Air Force was located years ago. Elie’s parents had lived in downtown Port-au-Prince before the earthquake. But when the temblor destroyed the capital on January 12, 2010 their house was fissured and they had to move to a tent at Aviation. Besides the Josephs, 1.5 million other Haitians were scattered to numerous other tent cities throughout the capital. The months crawled by after the quake and Elifete was able to buy some concrete, mix it, and pour a 9 by 12 foot floor for his one room tent. He shored the tent up with with wooden stakes. His walls and roof are made from blue and gray tarp that don’t leak too much in the rain. The one room has a single bed with a clean white sheet. Two walls facing each other have wooden shelves filled with clean plates. Elie’s only toy also sits on one of the shelves. It is a pole with a giraffe at top. Around the pole are multicolored plastic rings to move up and down. And one can push open a little wooden door on one of the walls that leads to a “kitchen” which is a couple of feet wide and long. A simple recho (iron grill) sits on the ground where Claudette cooks rice and beans with charcoal. Thousands of displaced people live in Aviation. The corridors are narrow between the tents and shacks. There are no secrets in Aviation. However to due to Claudette’s excellent care Elie was able to survive somehow in the filthy subhuman environment of Cite Aviation. Claudette recounted that she did not hear back from the American group about her passport to travel with Elie after June, 2012. To separate Elie from his mom and drag him to the Dominican Republic without her did not seem like the thing to do. He needed his mom for so many reasons. 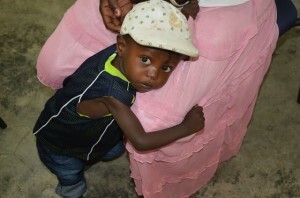 Claudette continued to take Elie back to the pediatric clinic each month for exams and medications that were keeping him alive. The rainy seasons came and went and Elie somehow hung on. 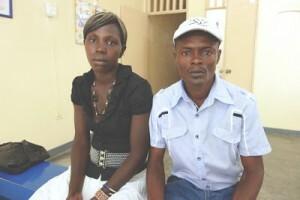 He didn’t get cholera or die after Hurricane Sandy struck Haiti in the fall of 2012. September, October, November of 2012 went by without news about Claudette’s passport. Yesterday Elie’s parents came to the clinic. Elie was not with them. They told me Elie had diarrhea and vomiting in the tent last month in early December. They quickly took him to a hospital on airport road where he was admitted. Elie was fragile and it doesn’t take much to push a little one like this over the edge. According to Claudette, the hospital staff started an IV, gave him oxygen, and started some medication. Elie was in the hospital for seven days and his diarrhea stopped. But it sounded like his breathing became more labored. Claudette and Elie clung to each other as usual and talked to each other. Elie did not eat during his entire hospital stay. On hospital day number seven Elie quit breathing and died. He was 2 years and 8 months old. Joseph is buried in Gran Cimetiere in Port-au-Prince. Elifete and Claudette told me the story about Elie’s hospitalization and death with no emotion whatsoever. It was told in the same manner I might describe to you about going to the grocery store or something stupid like that. Can you imagine if you in Peoria had a toddler who was diagnosed with a congenital heart defect that could be permanently fixed with heart surgery but you couldn’t get it done? Can you imagine living in a tent for the past three years and have no job to feed your family or your sick toddler? Can you imagine being told you need to walk to a latrine a long ways from your wretched tent in order to have a bowel movement and then have to pay one Haitian dollar for having the bowel movement in a totally rotten and smelly hole? That is exactly what the Joseph family is enduring the last three years. Would you be upset to have to bury your medically neglected two year old boy and get loans from friends and neighbors to bury him? Would you be a tad bit upset? 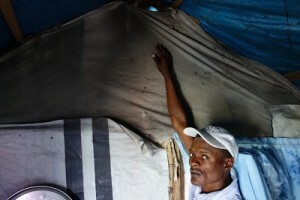 I asked Elifete and Claudette if they thought it was the Haitian governments responsibility to help them out in the tent. They calmly replied that yes they thought it was the government’s responsibility but in three years they had never seen anyone from the government visiting their tent city. They said they would be happy if a government official did visit. I asked them if they are angry about their situation. They said they are not angry that they live in these dire conditions. They explained to me that they have no money to build or rent. They didn’t take it any further than that. They never blamed anyone for anything and they didn’t blame anyone for Elie’s death. And in my opinion this attitude is not only the Joseph’s. My guess is that the majority of the estimated 350,000 still homeless people in Haiti’s tent cities don’t really blame anyone. It wouldn’t help anyway. But just because many displaced Haitians don’t seem to blame anyone doesn’t mean that their conditions are suddenly acceptable and fair. It is the opposite, of course. This is all cruel and seemingly hopeless right now as the tent cities seem to become permanent. We all need to know that we failed Elie, including me. Big mistakes plus little mistakes plus big negligence plus little negligence all adds together and equals death. Just because his parents don’t know how it all works, doesn’t mean people aren’t at fault. And we are all failing the hundreds of thousands of innocents living in the tents now. There is no urgency for the poor. There never has been.